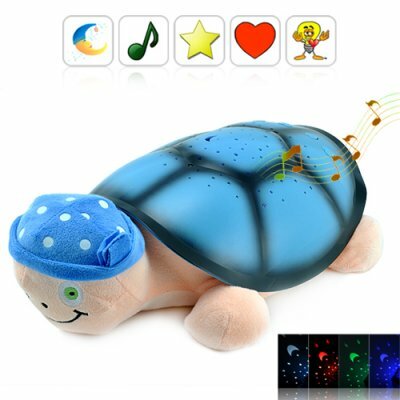 Successfully Added Timmy The Turtle (MP3 Player + Night Light + Remote Control) to your Shopping Cart. Timmy The Turtle - adorable and PRACTICAL! (How often can you say that about a toy!). This lovely and love-able plush toy plays MP3s, comes with a built-in 4 song melody player, is a night light and star projector, and even comes with a remote control. It can also be your child's best friend keeping them safe from the dark so they can get a peaceful sleep every night and be awake and refreshed for school the next morning. MP3 Player: Attach a USB flash drive filled with your child's favorite MP3 songs. Classics like Hokey Pokey (put your left foot in...) or The Teddy Bear's Picnic (if you go out in the woods today...). Then plug in the power adapter and Timmy The Turtle will entertain your child for hours. Melody Player / Night Light: Or throw in some batteries and your child can activate Timmy's built-in melody maker. Your child will be lulled asleep to 4 of the sweetest sleep lullabies ever. If they're afraid of the dark, Timmy The Turtle is also a great night light star projector. Perfectly Huggable: Timmy The Turtle is so much better than your average stuffed toy! It's an allergy-free plush toy that's cuddly and totally huggable. And because of its neutral color, it's perfect for BOTH boys and girls. Timmy The Turtle always smiles and is ready to keep your child company both night or day. Improve Their School Grades: Scientific studies have shown that two things contribute the most to a child's ability to learn during the school day. One is breakfast, another is a good night's rest. Many kids have trouble falling asleep or sleep fitfully as a result of primal fears associated with solitude and darkness. Timmy The Turtle to the rescue and watch your child's school improve with each pleasant night's sleep! In fact, when you see how well it works you might just be tempted to get a Timmy The Turtle for yourself! Perfect for small children or the child inside you, click "Add to Cart" now. This item is sure to be a great resell item as we expect Timmy The Turtle to be the next big toy wonder! Brought to you by the online China wholesale dropship leaders - Chinavasion! MP3 Player, play your own songs! This item [CVSB-LT26] is only available with a MOQ (Minimum order quantity) of 4 units. I know this adorable toy is for children, but I'm 32 and work really stresses me out. I'm a project manager at a leading software firm and I sleep lousy at night because of all the work-related pressures. Do you think Timmy The Turtle can help me? We're pretty confident that you'll be sleeping like a baby once you get your hands on Timmy The Turtle. Picture this: the room is cool and quiet. There's a light display of hearts, moons, and stars on your ceiling. A gentle lullaby is playing next to you inviting you to just relax and let go. Soon you fall into the best sleep you've had in your life and soon, you'll get a promotion at work because you're so productive.